Essays by Bill Bunn Available Now! There’s a lot new happening here at BDP this winter. First of all, we’re working hard on our three Spring releases: The Trajectory of Dreams, Hymns of Home, and Only the Moon Howls (Jay is working so hard that her own co-authored book, Truly Tricky Physics Problems, will be a little late). We have a full exciting catalog signed and in the queue for Fall 2013. These books will be added to the site as images become available. Our Fall authors–Susy and Bill–have been promoting their books in real and virtual media. 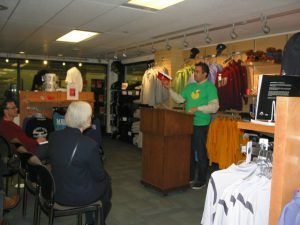 The picture shows Bill at a book signing for Duck Boy. He as a bunch of events scheduled for his new book, as well, Nicole Wolverton (Trajectory) also has a full schedule of events. Our first Web Bytez partner, Marie-Veronique Organics of Mill Valley, CA, also went live this month, and we’re doing sales through the store. More partners are signing up. It’s been quite a time for BDP, and as we approach our one-year anniversary, we’re amazed by how much we’ve grown. If we were a duck, we’d be a dinosaur by now! Quack.